Cordless hedge trimmers powered by batteries are one of three different types you can buy along with corded electric or gas powered. The main advantage of cordless trimmers is that they are not limited in range allowing the user to roam anywhere they need without having to worry about extension cords or gas. While not as powerful as gas-powered versions, they have come a long way and provide enough power to handle almost any job. The lithium-ion batteries make these a bit heavier and more expensive than electric models with prices ranging from about $60 to over $300. You should be aware of how much run time you can get and how long it takes to recharge the battery to make sure it will fit your needs. 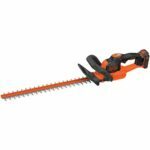 This type of hedge trimmer is perfect for home owners with a larger piece of property and who need a bit more range than an electric model can provide, but don’t want to spend the extra money or deal with the extra weight of a gas powered unit. Below we reveal our top 10 best cordless hedge trimmers. 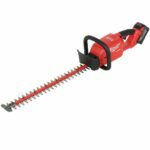 Below these cordless hedge trimmer reviews we also have a comparison chart so you can easily compare one model versus another. We selected the $199 EGO HT2411 as the best cordless hedge trimmer. This thing has tons of power provided by a 56 Volt, 2.5 Amp hour battery that can last for over an hour. Combined with a cutting capacity of 1-inch, it can tackle the toughest hedge trimming jobs and make quick work of them. The HT2411 is relatively light at 9.4 pounds for the power it provides and how long it can last. 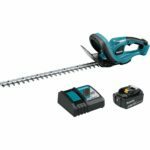 We also think the price point is just right – you can pay a lot more for models that are not as good as this one and while you can find cheaper cordless hedge trimmers, they will not perform nearly as well as this one. It has no major weaknesses. Overall we highly recommend the EGO HT2411 for anyone looking for the best cordless hedge trimmer. However, if you don’t have a large amount of trimming to do you probably can get away with buying a cheaper model. If you need long runtime and plenty of power then the DeWalt DCHT860X1 would make a good choice, however, it is on the expensive side at around $340. Power is provided by a 40 Volt 7.5 Ah li-ion battery that can last for a solid two hours. 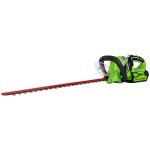 It has a 22-inch blade length and 3/4-inch cutting capacity. The main negative is that the DCHT860X1 is heavy at 12.8 pounds. It also is not real well balanced with most of that weight in the back of the machine. 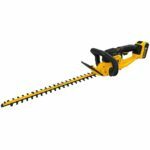 Overall we think the DeWalt DCHT860X1 is great for anyone who has a large amount of hedge trimming to be done where you can take advantage of the long runtime, and needs more power than an 18 Volt hedge trimmer can provide. The best 18 Volt hedge trimmer goes to the $329 Milwaukee 2726-21HD. It is also the longest lasting cordless trimmer on our list with a runtime that can last up to 3 hours. The 24-inch blades cut very well with a 3/4-inch capacity. The 2726-21HD uses Milwaukee’s M18 FUEL platform and comes with a large 9.0 Ah 18v battery. This makes it an even better choice for anyone who already has Milwaukee cordless tools that use the same platform. It is a bit heavy at 11.1 pounds, but it is pretty well balanced. Overall the Milwaukee 2726-21HD is super long lasting and doesn’t have any major weaknesses. We would not hesitate to recommend it to all users, but if you don’t need a long runtime you can probably get a cheaper hedge trimmer. The $129 Ryobi RY40610A hedge trimmer provides maybe the best value for its price. It comes with a 40v lithium-ion 2.6 Ah battery that will give you up to an hour of runtime. 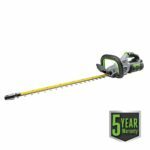 With 24 inch dual-action blades and a cutting speed of 3200 strokes per minute, which is higher than many other cordless models, this thing can handle any branches up to 3/4-inch. One unique feature on this Ryobi model is the ‘hedge sweep’ shield on top of the blade which lets you clear debris easily while you trim. It weighs about 9 pounds, so it is not super heavy or super lightweight either. Overall we think the Ryobi RY40610A is a great choice for anyone who needs plenty of power at a decent price and does not need hedge timming work for more than an hour at a time. If you have lots of light-duty work then the $195 Makita XHU02M1 is a great choice. It comes with an 18v 4 Ah battery that will last around 90 minutes. It is also pretty light at 7.4 pounds and is comfortable to use thanks to an anti-vibration design and padded handles. While the XHU02M1 works great with shrubs and hedges with small branches, the one weakness it has is that it can struggle a bit with thicker branches. The cutting capacity is just 1/2-inch. The $199 DeWalt DCHT820P1 is the best selling cordless hedge trimmer on Amazon. It also rated really highly from users with a 4.8 star average and even more impessively only 2% of over 600 reviewers rated it at 1 or 2 stars. This thing uses DeWalt’s 20 Volt max battery system with a 5 Ah battery that will last for about two hours of use. The DCHT820P1 has 22-inch long blades with a 3/4-inch cutting capacity. It cuts pretty well overall, but it can bog down on really thick branches. It is a bit on the heavy side at 11.5 pounds. It also does not have the best balance with more weight to the rear, but it is something we can overlook. 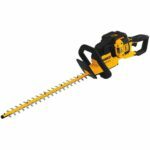 Overall the DeWalt DCHT820P1 would make a great choice for anyone who already has DeWalt 20V Max cordless tools, or anyone who wants a long lasting hedge trimmer. We think the best cordless hedge trimmer under $100 is the BLACK+DECKER LHT321FF which sells for $99. This thing is light at just 6.9 pounds, yet still has 22-inch long blades with a 3/4-inch cutting capacity. The LHT321FF is powered by a 20v 1.5 Ah li-ion battery. The main downside is that it only will last for about 30 minutes of runtime. The BLACK+DECKER LHT321FF is perfect for someone who doesn’t have a lot of shrubs, bushes, or hedges to maintain, but who still wants the portability of a cordless hedge trimmer. The cheapest cordless hedge trimmer to make our top 10 is the Worx WG255.1 which sells for around $80. The WG255.1 is also the lightest cordless hedge trimmer on our list at just 5.3 pounds. It is powered by a 20v 2.0 Ah battery that will last for a max of 75 minutes. The downside of the WG255.1 is that the blade length is just 20-inches with a 9/16-inch cutting capacity. So it will struggle with thick branches and may take more passes to get the same amount of work done as some other models. The Worx WG255.1 is perfect for someone who ranks weight and price as the top priorities and who does not have a lot of heavy duty work required. Another 40v hedge trimmer that sells really well on Amazon is the $125 Greenworks 22262 cordless hedge trimmer. We feel it is just a bit below the Ryobi RY40610A in terms of overall cutting performance, although the price and voltage are very similar. The 22262 comes with a 40v 2.0 Ah battery that lasts for around 45 minutes. It has 24″” long blades and has a cutting capacity of 2/3-inch. One plus is that it is pretty light for the power it provides at 7.8 pounds. The Greenworks 22262 isn’t the longest lasting cordless version on our list, but it provides a decent value for the price. 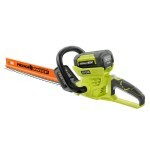 The best selling hedge trimmer with a battery on HomeDepot.com is the Ryobi P2660 ONE+ 18v Cordless Hedge Trimmer which sells for $129. This one has some nice additional features like a rotating rear handle and a HedgeSweep debris remover which clears clippings as you trim. The P2660 comes with an 18v 1.5 Ah li-ion battery that will last for about 45 minutes. The cutting performance is okay, but does not quite compare to some of the higher voltage or more expensive models. It does have 22-inch long blades and a 3/4-inch cutting capacity. It weighs 7.5 pounds. 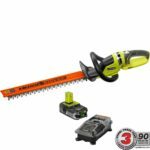 The 40 Volt Ryobi can be had for the same price and performs better, so this one probably only should be purchased if you need a lighter weight trimmer or have other 18v Ryobi cordless tools that you can share batteries with.